The World Next Door Review – AiPT! Viz Media has been known for its manga and anime releases for decades now, but this week marks the company’s first foray into a more interactive medium: videogames. 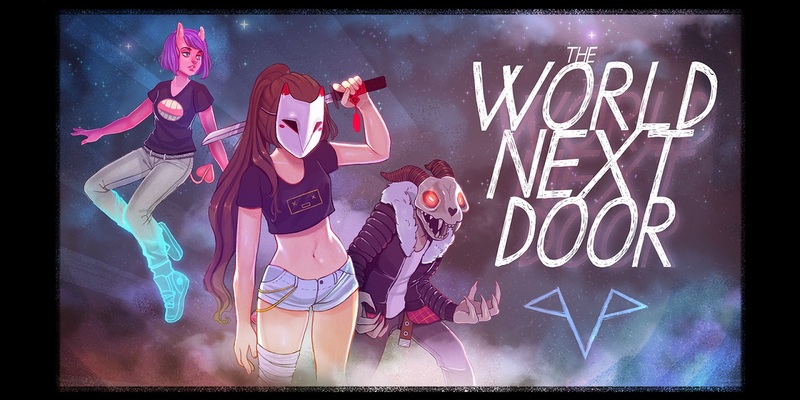 Their new title The World Next Door was developed in conjunction with Rose City Games, and the game’s press bills it as incorporating action-adventure and visual novel elements. It stars Jun, a human who gets trapped on the fantasy world Emrys and must work alongside her new alien friends to find a way home. There are a lot of influences and ideas at play here, but are they all integrated effectively? Is The World Next Door good? The strongest aspect of this game is definitely its character designs. I’m a big fan of masks, and Jun’s contrasts against her otherwise casual daywear for a fun mix of mystery and style. The denizens of Emrys, meanwhile, are all humanoid but have fantastical touches. Horace’s skull head and black jacket combo are the textbook definition of cool. The other protagonists have tails, gems jutting out of their skin, and more. The color choices in the apparel also look great; Vesper’s pink and white getup is a particular highlight for both pure aesthetic appeal and rendering a squid motif without relying on more obvious choices such as blue tones. The game’s environments and monsters also look decent, albeit less unique. There are only a handful of settings and they mostly touch on standard fantasy elements: the forbidden temple, the lava area, etc. The colors throughout are bright and pretty and the art as a whole looks polished, but your mileage may vary in terms of how much you actually care for the style. The characters and their worlds are all rendered to be very little; I wouldn’t call them chibi exactly but they’re in that vein. They don’t look bad but their size makes it difficult to see much detail outside of the larger, visual novel-esque character drawings. The monsters in particular suffer from this. They have a lot of cool elements in their designs, but you can barely see them because their character models are so small. Gameplay-wise, The World Next Door is okay but not groundbreaking by any means. Players cast magic spells by transferring runes around so that like kinds are on adjacent tiles to each other. It’s simple but fun in brief doses. There’s a definite cellphone game feel to it which isn’t a bad thing; it just doesn’t lend itself much to creative strategizing. Thankfully the game is short enough that you probably won’t get too tired of the tile-swapping unless you try and beat it all in one go. The gameplay’s mechanics themselves aren’t as troublesome as the cramped dungeons one must play in. A lot of the areas are very cramped, and the frustration this causes when one keeps bumping up against ledges and enemies doesn’t feel worth putting up with given the gameplay’s simple, repetitive nature. Unfortunately, the game’s visual novel elements aren’t any stronger than its gameplay. Players are regularly presented with opportunities to choose which of the friend characters to interact with, generating an expectation for multiple character paths. With that said, none of them actually get full story arcs or anything even approaching that. Ultimately the choices one makes when interacting with other characters largely feel meaningless. All the player gets for their trouble is the opportunity to go back through dungeons they’ve already completed, this time with a little extra dialogue. Unsurprisingly, the characters end up feeling relatively flat and underdeveloped. They’re likable enough, but for a game that draws upon visual novels as inspiration to not incorporate character growth is disappointing. The rest of the game’s writing has similar strengths and faults. There are cool ideas and the developers definitely tried to incorporate a lot of lore, but not enough actually gets done with it. Emrys doesn’t stand out much from other sci-fi worlds. While some history is laid out for its magical nature and its relationship with Earth, it’s not made deep or unique enough to make one terribly interested in finding out more. There’s a foundation that a longer game could have fleshed out into something memorable, but as is the lore feels more like a bullet point list of ideas than an actual world’s history. That brings me to my main qualm with the game that stretches across most of its facets: it’s just too short. I was able to finish it in less than five hours without rushing by any means. For a character-driven game with roughly half a dozen main protagonists, that just isn’t enough time to pack in much satisfying character development. Lore also gets introduced just to never be mentioned again, and the same occurs with some major plot points. Most of this game’s most striking faults could have been alleviated by just giving the story more room to breathe. As a whole, I enjoyed The World Next Door. The core cast of characters is likable and their designs are fantastic. The gameplay is also fun despite its simplicity and some overly cramped dungeons. Nonetheless, the story comes to a close before it has a chance to breathe, robbing the visual novel aspects of their full potential. Your mileage may also vary on how effectively the game’s art style generates excitement and interest in the sci-fi world. If you’re looking for something cute that you can finish within a few sittings, then this game isn’t a bad choice. Just don’t go in expecting too much substance or you’re likely to get disappointed. If you're looking for something cute that you can finish within a few sittings, then this game isn't a bad choice. Just don't go in expecting too much substance or you're likely to get disappointed.